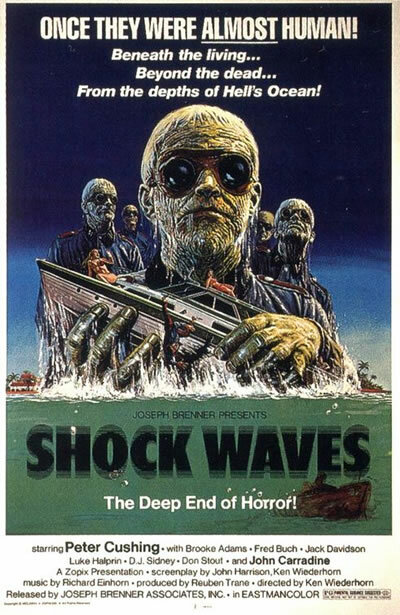 Ken Wiederhorn’s atmospheric and genuinely eerie SHOCK WAVES (1977) is an American cult horror film that kickstarted the ‘Nazi-Zombie’ sub-genre of exploitation films that soon followed. Severely sunburnt and unable to communicate after being stranded in a dinghy at sea, Rose (Brooke Adams) is discovered by a group of fishermen who quickly drag her onto their boat in an attempt to help her. Providing her with fresh drinking water to prevent further dehydration Rose begins to recount, in narrated flashback, how her island cruise with a group of holiday makers had turned into a Fulci-esque nightmare. With very few options the group begin to search the island, soon discovering what is initially thought to be an abandoned estate. However it is soon revealed that the island has served as voluntary exile to former SS Commander (Peter Cushing) who upon revealing himself orders the intruders to leave the island immediately. His advice however comes too late as the undead “Toten Korp” (aka “The Death Corp”) rise from the depths of the ocean to wreak havoc amongst the living! SHOCK WAVES is highly underrated. Unlike the short-lived trend of underwater ‘Nazi-Zombie’ sleaze and excess in exploitation films like Jean Rollin’s ZOMBIE LAKE (1981) and Jesús Franco’s OASIS OF THE ZOMBIES (1981) Ken Wiederhorn has directed a horror film that surprisingly relies on more of a suggestive aesthetic, much like the work of producer Val Lewton and RKO Pictures, that becomes genuinely disturbing. Combine this with Richard Einhorn’s soundtrack and the bleak atmosphere provides a level of dreamlike ambiguity that makes SHOCK WAVES a highly recommended cult chiller. There are actually eight actors playing eight different zombies in the film, although it appears that there are many more.